I love cooking but I have to admit sometimes I struggle cooking for just myself, though on a 5:2 diet fast day it seems to give me some comfort and obviously distracts me. While my fellow 5:2 dieters bemoan having to cook for their families, perhaps I should count myself lucky that I can avoid having temptation at hand while I am still trying to lose a little weight on the 5:2 diet. But, at various points in my life, I’ve had family, boyfriends and flatmates to cook for and with and there’s a real joy about cooking and sharing food that you don’t get if you live alone. But, I still believe it’s healthier and a more cost-effective option, so I continue to make an effort to cook from scratch. I do have a few shortcuts though – cooking and freezing homemade ready-meals, making up mixtures that can be used in a variety of dishes (mince for example – one day for spaghetti bolognese, the next for chilli). One thing I get a bit lazy about is making vegetable dishes like mash – but this particular use for leftover carrot and sweet potato mash is a bit of a winner! I made up the mash yesterday as part of a review I was writing. It’s a flavour combination I really enjoy, but one sweet potato and two carrots made enough mash for about 4 portions! And as always I’m out quite a lot in the next few days – one meal at home will be about all I can manage and I doubt I’ll want more than soup. I could of course, have frozen the mixture. But, I also want soup at the moment. The danger otherwise is that I’ll go out for a reception with nothing but those dainty little canapes, feel hungry on the way home and end up buying chips! And with boot-camp coming up I just need to avoid that risk!!! 400 g Sweet Potato and Carrot Mash I made my mash with 50% sweet potato and 50% carrot by weight. Just boil until soft, drain and mash. Taste and adjust the soup, adding salt and pepper as necessary. So, I’ve used the mash to make soup. Using up mash in soup is nothing new, it works very well as a way to thicken all sorts of soups. But this version stands on it’s own! 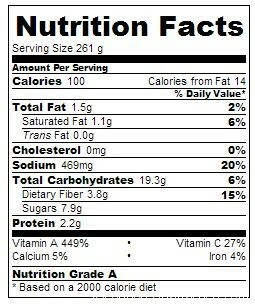 This particular combination of ingredients makes a 100cal a portion soup. If you are not dieting, consider making it up with coconut milk to replace half the stock. Delicious! But, that would double the calories so for the sake of creating a 5:2 diet friendly recipe, I’ve just added a little creme fraiche and a few fresh coriander leaves at the end, resulting in a soup at about 100 calories a bowlful. It’s a vitamin packed mixture that could easily be made vegan by leaving out the creme fraiche and substituting a little coconut cream. I love soups! I always take them to work for lunch even in summer. This would the ideal kind of soup for me to make………..mmmmm! YUMMY!! love this! this looks so tasty. I will have to do this!! 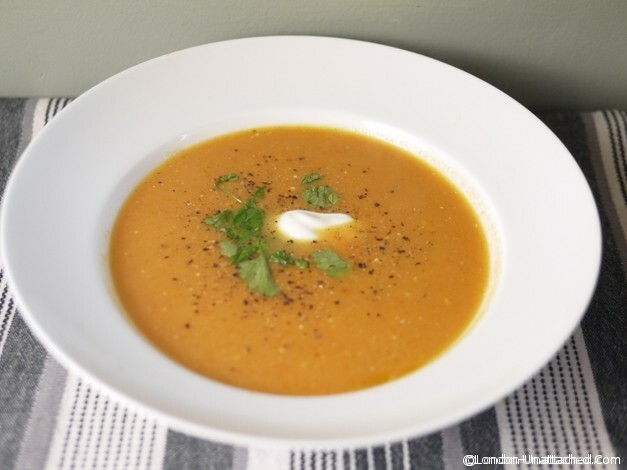 I love Sweet Potatoes and soup, so this sounds perfect to me and looks delicious! This looks amazing. Is there a non-dairy alternative to creme fraiche. Good recipe, but I will skip that coriander for something else. This is along the lines of the parsnip soup I am also trying…soon getting cold here, so this will come to mind. This looks like a nice, tasty and healthy soup recipe!! I love both sweet potato and carrots so I’ll give this one a try! I’m not familiar with the diet you are on, but the recipe sounds very yummy. I think you could ‘thai’ this up with some coconut milk and a bit more fresh coriander…you can see my cooking is REALLY subtle can’t you!! !